Like cinnamon, cloves are used widely in both sweet and savory dishes. 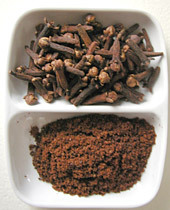 Cloves are a component of many spice blends, including apple pie spice and Chinese five-spice. Whole cloves are used in mulled beverages and cooking liquids or pierced into stewed meats, particularly hams. Ground cloves flavor rich savory sauces, rubbing blends for meats, and sweet cakes and cookies. Cloves have a very warm, pungent, sweet aroma, with a slightly astringent quality. Oil of clove is prized for its antiseptic qualities, and is often used in toothpaste and mouth washes. It is also know to ease toothache. The tree which produces cloves belongs to the myrtle family and is native to the Indonesian archipelago, although it’s now grown predominantly in Zanzibar and Pemba, off the east African coast. Buy cloves whole or ground. For best flavor, grind your own from whole cloves, using the bud itself and discarding the nail. Ground cloves should be purchased in small amounts, as it loses flavor quickly. This entry was posted on Saturday, November 3rd, 2007 at 5:59 am	and is filed under Encylopedia, Herbs & Spices. You can follow any responses to this entry through the RSS 2.0 feed. You can leave a response, or trackback from your own site.